Your Daily Art Jewelry is my handmade line of jewelry. 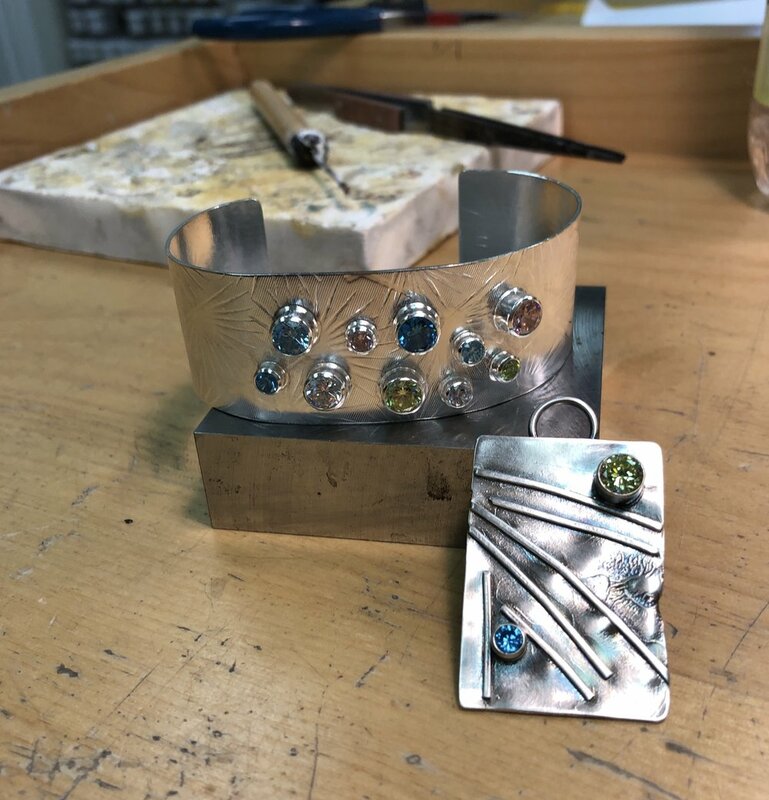 I have been metal smithing for about four years and before that I created beaded jewelry. After seeing the Soleri show at MOCA Scottsdale, we went over to Cosanti in Paradise Valley, AZ to buy a couple of bells for ourselves. The Scottsdale Museum of Contemporary Art in Scottsdale AZ has a retrospective of the work of artist/architect Paolo Soleri open until January 28, 2018. Soleri studied at Frank Lloyd Wright's Taliesin West and with the famous architect himself, although Soleri's designs took on a more amorphic and almost insect-like look about them. This work is a dam design for Mesa, AZ. It really resembles what you imagine a dissected ant hill might look like. Soleri founded two schools/art residences around Phoenix which are both still functioning, Cosanti and Arcosanti. Soleri and his students started making bronze bells as a source of income and an artistic outlet. The bells can still be purchased at Cosanti. My family was fortunate to have another trip to Michigan's Mackinac Island again this year. We stayed at the Grand Hotel, whose legendary front porch and beautiful surroundings are a treat unto themselves. I wandered into the gallery area in the main Parlor which exhibits paintings from the world renowned Manoogian Collection. The Manoogians have exhibited over 400 paintings from their collection at the hotel for the past 25 years. Here is a sample of some of the pieces on display this summer. The works on display include 19th and 20th century examples of many different types of painting genres and by a large collection of artists. A Liberated Woman by John G. Brown, American, 1831-1913. My assumption is that the cigarette and the way she looks down at the viewer indicate her liberated status. Statue of Liberty Celebration by Frederick Rondel, American, 1826-1892. This is just a small sample of the artwork on display, there are many fine examples of portraiture, tromp l'oeil, landscapes, still lifes, etc. The art on display makes an already worthwhile trip all the more special. I participated in Cleveland Rooms to Let 2016 where curated a room that will feature the dinnerware designs of Cleveland Artist, Designer and CIA professor, Viktor Schreckengost. The installation will be called Everyday Dishes and is based on an exhibition I curated in 2004 at the Northern Clay Studio in Minneapolis called The Dinnerware Legacy of Viktor Schreckengost. The dishes Viktor designed when he worked for Salem China and American Limoges in Sebring, OH in the early part of the 20th century, were the dishes that people used to eat their daily meals and would have bought at stores like J C Penny, Sears and Montgomery Ward. They were not the good dishes that only came out a couple of times a year, but the ones that they grabbed for their morning toast and set their dinner tables with. The Rooms to Let Cleveland event will took place on May 21 & 22, 2016. Hope you can make it over next weekend. There will be a lot going on. My installation "Everyday Dishes" will give some history of the ceramic factories of Ohio and touch a nostalgic note or two. Room to Let website. With many ongoing building projects in the works, archaeologists in London are quite busy as remnants of Roman occupation, the Bedlam cemetery, and other yet to be determined sites are uncovered during construction. They have found many skeletons and are doing DNA testing to determine cause of death, background, etc. It is hard to believe that such a busy modern city is also a very active archaeological site. Whole pots were preserved inside timber dwellings destroyed by fire. Archaeologists discovered there was still food in some of them. Artist Cal Lane uses metal as her palette and a torch as her brush. She creates amazingly intricate designs in found metal objects. Tools, pieces of old cars, etc anything rusty that she can transform into her lace-like creations. The Nelson-Atkins and the St. Louis Art Museum have loaned their Waterlilies by Monet to the CMA so that the three images could be joined together again. The Cleveland Museum of Art is hosting an exhibition entitled Painting the Modern Garden: Monet to Matisse now through January 5, 2016. The exhibition, organized by CMA and the Royal Academy of Arts in London, looks at the role of gardens to artists such as Claude Monet, who was also a horticulturist. Spotted during the set-up for the exhibition, did the man himself drop by? If you live in Cuyahoga County please vote today and vote yes on Issue 8 which continues the funding for the arts via the cigarette tax. It has done so much to enrich NE Ohio and it is not an increase, it just keeps the funding in place. The exhibition Beyond Materials: Woven Values at the Stamps School of Art and Design at the University of Michigan's Work Gallery. Takes a look at textile art outside the traditional. Beyond Material is curated by Kate Garman. Beyond Material has been shown in two other iterations before the Ann Arbor venue and featuring other artists, at Grand Valley State University Padnos Art Gallery and East Lansing’s Scene Metrospace gallery. The show features artwork that reflects the history of fiber work (which has traditionally been viewed as a "craft") as textile based art moves forward as an ever evolving, viable art medium. The exhibition is up until October 3, 2015. Timelines by Christine Mauersberger. Photo by the artist. These photos are from the Nick Cave exhibition HereHear at the Cranbrook Art Museum in Bloomfield Hills, MI. The exhibition is up until October 15, 2015. The show has featured interactive happenings throughout the metro Detroit area and there are still a couple of events coming up. You can check the Cranbrook museum website for more information. Artist Kehinde Wiley will speak at Cleveland Museum of Art's Gartner Auditorium, Saturday August 29th at 2:00. His beautiful work harks back to an earlier style while creating very modern portraits. Wiley's recent one man exhibition at the Brooklyn Museum was very well received by the art world and the public, alike. The Cleveland lecture is part of the Cleveland Public Library's The Lockwood Thompson Dialogues. The Saginaw Art Museum in Saginaw, Michigan is a perfect example of a group of people who came together because they did not want to see another loss in a city and state that has already lost so much. I grew-up in a suburb of Flint, Michigan so I understand how hard it has been for these places to hold on in the wake of the loss of jobs, people, tax support, state support, etc. However, a group of Saginaw citizens led by a strong and generous board and a savvy leader, not only saved this museum, but brought it back promising to be much more than it was ever before. You can read about the renaissance here and if you find yourself in the Mid-Michigan area, you will definitely want to drop in. I am currently working with the museum as a consultant to re-establish and re-open their gift shop. Our plan is to have the shop fully stocked with unique products in September. There was a uplifting art happening in Cleveland last weekend called "Rooms to Let." It was the second such event where foreclosed and abandoned houses in a hard hit area of Cleveland (houses that are scheduled to be demolished) are turned over to artists, who give them one last celebratory and dignified, send-off. The houses are all roughly a hundred years old and the last few years have been less then their best years. They are filled with character, beautiful wood, built-in china cabinets, window seats, etc., but what the artists focus on, for the most part, are that the houses are also filled with the lives of their former occupants. The houses sheltered people whose lives cry out to be celebrated before the tangible evidence of their exsistence is gone forever. We as a society, especially one hard hit by its changes like Cleveland's Slavic Village, are too quick to erase the past as we rush toward the future and we often don't realize what has been lost until it is no longer there. "Rooms to Let" stops us in our tracks and makes us look at these places, see the beauty, enjoy some music, laugh and talk with people, honor these structures and the families who lived and loved in them. Having become blighted and a burden on the neighborhood, the city has no choice but to tear them down. This has been the story for many rust belt cities who deal with a loss of population and aging housing stock. For one more weekend though, people filled rooms, created music, gathered around them and enjoyed life. It was a celebration of the service of the houses as dwellings and the lives of the people who lived in them. This article on Artnet features the amazing excavations taking place on Easter Island as the mysterious Moai statues are much more then they appear. family arrived on the Islands in 1923 for a short visit and stayed. He was a printmaker and during his career created some of the most beloved images of the Hawaiian Islands. Salisbury Cathedral from Lower Marsh Close, 1820 by John Constable, National Gallery, Washington D.C. This version was painted after the first one was thought to be "too dark" by the family. The spire is 404 feet tall, the tallest church spire in England. It is a Gothic style structure completed in the 1300's.